Audreys View in Cockermouth, Cumbria sleeps 2 people. Audrey’s View in Cockermouth is a terraced cottage sleeping 2 guests which is perfect for couples and offers a spacious double bedroom and bathroom on the first floor, along with a cosy living room and kitchen on the ground floor. It also benefits from a small, enclosed, east-facing patio at the rear complete with garden furniture, which is great for soaking up the morning sun. The property is named after the owners friendly West Highland Terrier, Audrey, and pets are very welcome at Audrey’s View. Audrey’s View is perfect to explore the delights of Cockermouth on foot, thanks to the parking permit provided you can leave the car behind and walk just 200 yards to the main shopping street and town centre. This famous and thriving market town is full of hidden surprises at every turn. It boasts quaint restaurants, a great selection of pubs and micro-breweries, independent coffee houses, local craft shops and delicatessens, speciality shops and well known retailers. If you like culture, The Kirkgate Centre shows movies, arts and drama, 250 yards away. Visit the birthplace of William Wordsworth and feed the ducks in the memorial gardens, 900 yards, hire bikes from the town centre, 500 yards, or take a swim at the local leisure centre, 750 yards. You’ll also find the famous Jennings Brewery nestled beneath the castle walls where the River Derwent and River Cocker meet. Cockermouth is right on the border of the UNESCO World Heritage Site, the Lake District National Park. Take a 5-mile drive to Bassenthwaite Lake at the foot of the Skiddaw range for fantastic walks, woodland and wildlife. The Lakes Distillery offering tasting tours as well as the Lake District Wildlife Park are both just 6 miles away. The popular town of Keswick is 14 miles away and can be reached by car in about 20 minutes. For walkers and cyclists the route through Whinlatter Forest Park and down the valley to Buttermere boasts stunning panoramic scenery. So whether you prefer the serenity of the seaside, the rugged adventure of the mountains, the natural beauty of the Lakes and surrounding scenery, or you just want to get away for some rest and relaxation, you can have it all at Audrey’s View. The beach is 7½ miles from Audrey’s View in Cockermouth. With the shop and pub ¼ mile. The restaurant is ½ mile from Audrey’s View. 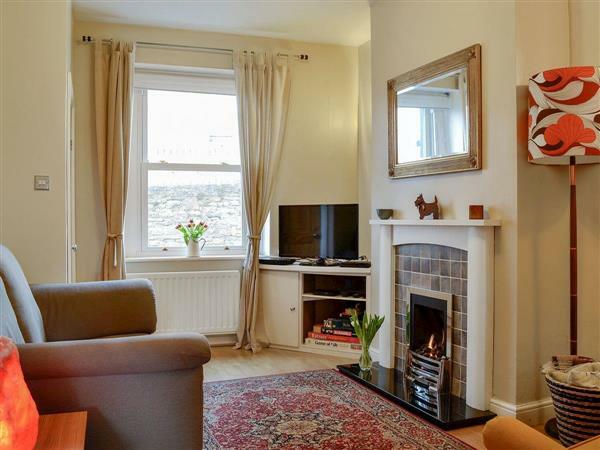 Living room: With gas coal-effect fire, 32 Sky TV, DVD player and wooden floor. Kitchen/dining room: With gas cooker, microwave, fridge, freezer, washing machine and tiled floor. Gas central heating, gas, electricity, bed linen, towels and Wi-Fi included. Small enclosed garden with patio and garden furniture. Parking permit for 1 car included. No smoking. Holidays at Audreys View run from Saturday to Saturday. Pets allowed at Audreys View. For a better idea of where Audreys View is, you can see Audreys View on the map below. Audreys View is in Cumbria; should you be on the lookout for a special offer, you can find all the special offers in Cumbria. It's always worth checking to see what is on offer at the moment. Do you want to holiday near Audreys View (UK1269), you can see other cottages within 25 miles of Audreys View; have a look to find your perfect holiday location.